Symbols of past glory, of empire and and global reach, caravels and carracks still sail in Lisbon, woven in Persian 17th century carpets, painted on Japanese screens or even depicted in pavement cobblestones. All reminders of nearly six centuries of empire, for good or for bad. Seeing these emblematic ships at a moment when the Brexit furore is reaching a crescendo in England made me ponder the parallels of the erstwhile Portuguese and British Empires. Haddon Hall, in the Derbyshire Peak District National Park, is a celebration of oaks. Its construction, contents, history and present day lands are hallmarked by oaks. It was thus an extraordinary place in which to be able to draw in metalpoint and prepare an exhibition for September 2019 about oaks and their future. Linking my passions for art and the environment are “Oak Matters”. Visiting master embroiderer Alain Dodier in Sainte Valiere, Southern France, was like straying into a medieval scriptorium, save that Alain is very much of our time Nonetheless, as he creates intricate vivid scenes in silk embroidery threads, using Bayeux stitching that harks back to the 11th century, his passion and dedication to historical detail and fidelity reminded me of the slow and painstaking creation of illuminated manuscripts that tell stories of great import to Western culture. His seven-meter panel about the Pilgrims’ Route to Santiago de Compostela is one such work. A well-respected and prolific Spanish writer, poet and essayist, Felix de Azua, has just published an Autobiography without Life or Autobiografica sin vida (Mondadori 2010) which sounds fascinating and thought-provoking. Starting with the book cover which uses an image from the 30,000 year-old drawings of horses found in the Chauvet Caves in France, he traces his own life, that of his generation and, in a wider sense, that of western art in general by images of artwork down the ages. His thesis is that the art we humans create bears witness for us as human beings. For century after century, representative art has reflected our place in the world, showing what surrounds us, and what matters to us. At the same time, that art also acts as a substitution for the reality depicted. But over the generations, Felix de Azua contends, this magic has been diluted, dissipated, stolen from art - he cites David's Marat, Goya's Disasters or even Rothko's work as having converted art's magical qualities into shadows and undiluted (maybe soulless?) representation culminating in today's performance art. In Azua's opinion, the nuclear bomb unleashed at Hiroshima not only proved to all mankind that our species is capable of total self-destruction, but it also caused a huge rift in the history of art. Azua feels that we are thus in the early days of a totally new era in art, one that is full of complexities, given man's awareness of his own potential disappearance. Our awareness of the nuclear threat may be only subliminal now, but the threat does influence today's forms of art. Nonetheless, the magic inherent in art-making still exists or can exist. This "communion with the cosmos" is still necessary for us as humans, in art, in literature, in falling in love. As Azua remarks, "I also know that we cannot do without art, just as we cannot do without religion or science." As I listen to the complex issues and concerns that the thousands of climate change delegates are grappling with at the on-going Copenhagen Conference, I keep thinking of all the art that has been done over the past centuries that is, in essence, a record of the world as we have known it. From John James Audubon, with his masterful opus recording America's bird life, to the myriad wonderful botanical artists working today, like Australian Margaret Saul, or wildlife artists like British David Shepherd or American Timothy David Mayhew, there is an important role for art in the discourse on our planet's health. Every time I do a silverpoint drawing of a fragile spring flower, for instance, I find myself wondering how many more springs will be graced so predictably with these flowers. I am sure that Audubon would be appalled to know the status of many of the birds he depicted. 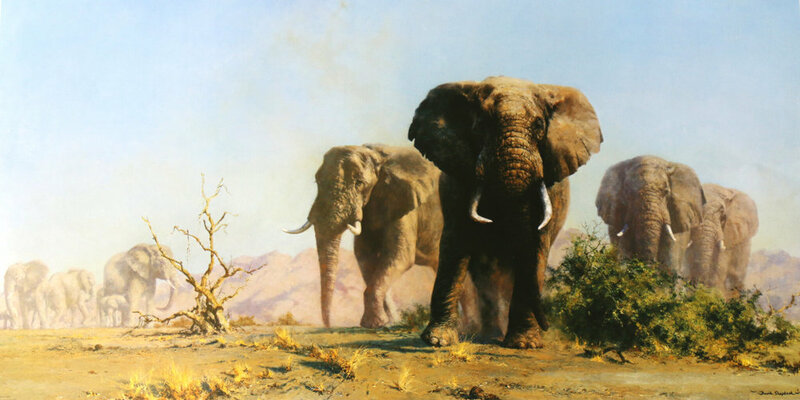 I suspect that David Shepherd finds the East African flora and fauna he celebrated so wonderfully in the 1960s, for instance, to be sadly changed and diminished. When artists of all descriptions find themselves recording endangered species and reminding their viewers of vanishing beauty and complexity, it is a situation of sounding the tocsin. I hope that the politicians gathered in Copenhagen are art lovers. The passing of years since September 11th, 2001 has brought so many changes around the world that one can scarcely put oneself back in the frame of mind of that time. I suddenly remembered a painting that I did to deal, in some measure, with my own emotions after the Twin Towers fell and so many people perished in such frightful fashion. I had loved the brashness of the Twin Towers when we lived in New York. Taking visitors up to the top of the world, as it felt, on the top viewing deck, was so utterly New York in its drama and strange combination of elegance and a technological defiance of nature. It seems that artists dealt with these events in a multiplicity of ways, many working on sculptures and pieces some years later. I found allusions to many of them again today in Tyler Green's blog at Modern Art Notes. In some fashion, the responses had to do with the degree of connection to New York, I think, and also, of course, the degree of political involvement of each artist. Personally, I painted and drew my piece about a month after September 11th, really before the Bush administration became, in my opinion, out of touch with many of the more admirable aspects of the American Constitution. As a European, I had always been very aware of the legend of Manhattan's streets being paved with gold. Purple is also the colour of deep mourning in the world I know. Violets often signify faithfulness, watchfulness and modesty. Faithfulness to duty and cause, as far as the firefighters and police and other responders were concerned, watchfulness too, and modesty, in a way, for all those people who were going about their daily business in the Twin Towers. I tried to combine these aspects with the island of Manhattan, the flight paths of the various planes and then the unimaginable debris of the fallen towers. It was strange to pull out this painting and look at it again today, but perhaps this, of all days, is the day to do so.